PDAL doesn’t provide every possible analysis option, but it strives to make it convenient to link PDAL to other places with substantial functionality. One of those is the Python/Numpy universe, which is accessed through PDAL’s Python bindings and filters.python filter. These tools allow you to manipulate point cloud data with convenient Python tools rather than constructing substantial C/C++ software to achieve simple tasks, compute simple statistics, or investigate data quality issues. This exercise uses PDAL to create a histogram plot of all of the dimensions of a file. matplotlib is a Python package for plotting graphs and figures, and we can use it in combination with the Python bindings for PDAL to create a nice histogram. 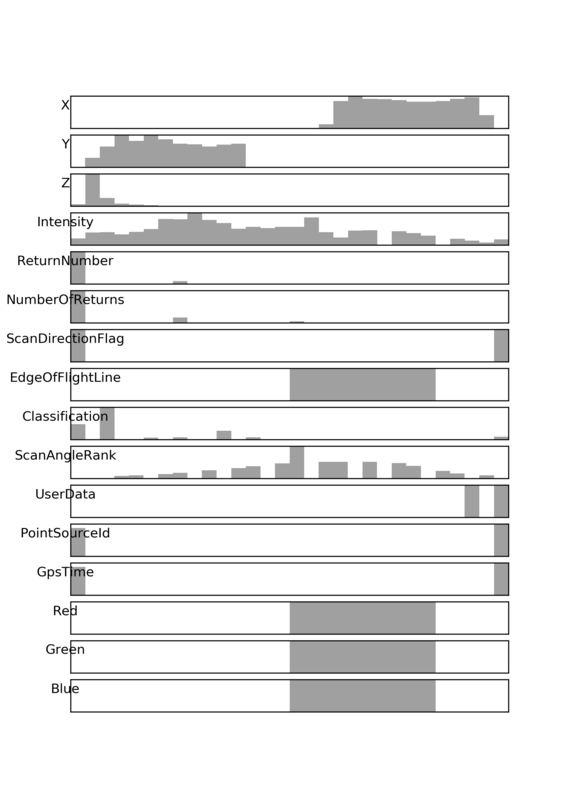 These histograms can be useful diagnostics in an analysis pipeline. We will combine a Python script to make a histogram plot with a pipeline. Python allows you to enhance and build functionality that you can use in the context of other Pipeline operations. We’re going to create a PDAL Pipeline to tell PDAL to run our Python script in a filters.python stage. This pipeline is available in your workshop materials in the ./exercies/python/histogram.json file. The following Python script will do the actual work of creating the histogram plot with matplotlib. Store it as histogram.py next to the histogram.json Pipeline file above. The script is mostly regular Python except for the ins and outs arguments to the function – those are special arguments that PDAL expects to be a dictionary of Numpy dictionaries. This Python file is available in your workshop materials in the ./exercies/python/histogram.py file. # StringIO for Python 2. # and the nwrite that to a file. # return True to tell the filter it was successful. writers.null simply swallows the output of the pipeline. We don’t need to write any data. The pdalargs JSON needs to be escaped because a valid Python dictionary entry isn’t always valid JSON.